For the second night in a row, #11 Minnesota State broke a 3-3 tie and went on to defeat the #8/9 Terriers. This time the final was 5-3 at the Verizon Center in Mankato. 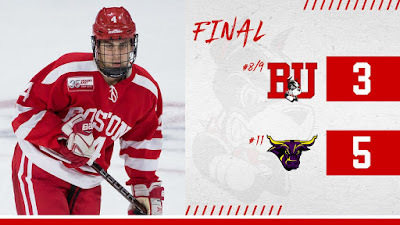 BU had rallied from a 3-0 first period deficit to knot the score in the second, only to have their hosts add a fourth goal with less than a second remaining in the period. Controlling draws and possession early, MSU scored twice in the middle of the opening period, first on Jared Spooner’s redirection and three minutes later on Connor Mackey’s power play goal. Late in the period Riese Zmolek extended the lead on a partial breakaway. BU’s offense came to life in the middle period as it outshot the Mavericks, 18-6. With BU a man down, freshman Joel Farabee stole the puck, regained his footing after being tripped and raced into the MSU zone to beat Dryden McKay for his first collegiate goal. Two minutes later, senior co-captain Bobo Carpenter redirected sophomore David Farrance’s shot past Dryden with junior Patrick Harper also assisting. After McKay had made two highlight-reel saves, sophomore Shane Bowers converted a Farrance pass from the right crease in the final minute to pull BU even at three apiece. That didn’t last long. At 19:59, Charlie Gerard scored on the rush to put the Mavericks on top to stay. 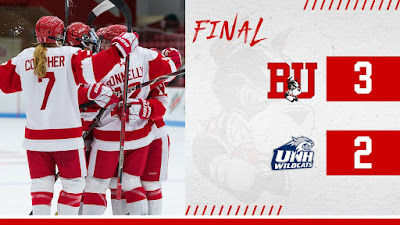 Once again, penalties put a crimp in BU’s attack, committing three infractions in the final period as the Terriers were pushing for an equalizer. BU had just 25 seconds of power play time in the final period. Jake Oettinger made a huge glove save on a Mavericks power play to keep the margin at one before a Marc Michaelisempty-netter closed out the scoring. Rebounding from a tough first period, Oettinger stopped 18 of the last 19 shots he faced and had 26 saves overall. BU failed to cash in on any of its six power plays, although three of them were abbreviated (one lasted just seven seconds). 2020 recruit Dylan Peterson scored the game-winner in the NTDP U17s 4-3 win over Minnesota Elite League North. It was the second tally of the season for Peterson. Fellow recruit Drew Commesso stopped 18 shots to gain his fourth victory. Brady Tkachuk assisted on two goals in Ottawa’s 5-1 win against Los Angeles. Charlie McAvoy scored on a hard wrist shot off a faceoff for his first goal of the season as the Bruins blitzed Detroit, 8-2. 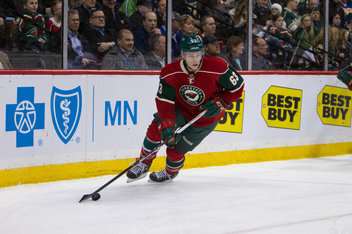 Charlie Coyle scored his first goal of the season in the Wild’s 5-4 OT loss to Carolina. Behind two goals from red-shirt junior Sammy Davis and a three-point game from sophomore Jesse Compher (1G, 2A), the Terriers gained their first win of the season, edging New Hampshire, 3-2. Freshman Kate Stuart picked up her first win, stopping 18 shots. BU is now 1-1-2 after four games.